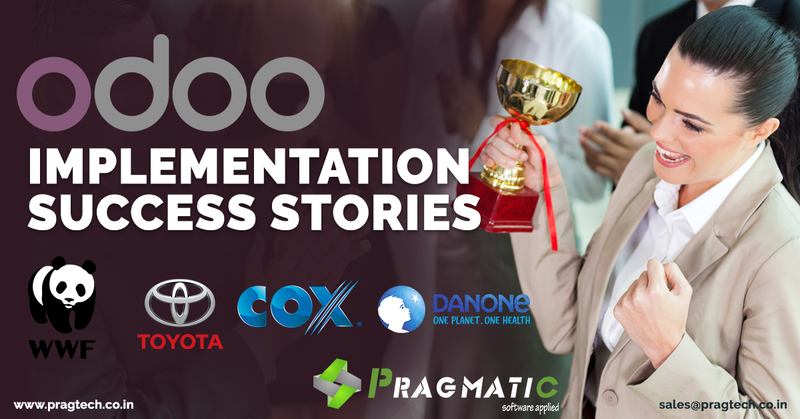 Odoo’s 4 Major Success Stories Worth Knowing. More than 2 million users choose Odoo to run their businesses. For major logistics and material handling operations, efficiency is everything. When a business operates a distribution network on an international scale, every second counts. Every workflow has to be optimized. Every change has to be carefully implemented, or the results can be catastrophic. In these operations, a functional enterprise resource planning (ERP) solution isn’t just a luxury—it’s a necessity for staying competitive and collecting vital data for important business decisions. ERP software must be highly customizable, powerful, and easy to implement. That’s a tall order, given that many ERP software packages are built as a one-size-fits-all solution. For companies like Toyota Industries Corporation, major ERPs had a considerable flaw: they couldn’t quickly add new features to adjust to the corporation’s rapidly changing needs. Toyota Material Handling in France required an ERP solution, and after evaluating the enterprise-level options on the market, they chose Odoo. Incredibly, they were able to implement the software in only six months. The big difference between Odoo and other ERPs? Odoo allows third-party app developers to offer new functionality for Odoo users through a growing development community. Traditional ERPs couldn’t offer this advantage; while some enterprise ERP software suites allow feature development, they’re not open source, so new features are necessarily more limited. More importantly, developing those additional features would take time—something that was in short supply for Toyota Material Handling, as they needed to quickly integrate a new system in order to maintain efficiency at their facilities. By choosing Odoo, Toyota Material Handling could focus on customizing the ERP’s platform for their business’s unique features. They could supplement Odoo’s core functionality with apps from the community, developing new features on an as-needed basis. Toyota could also integrate Odoo with their legacy systems, dramatically reducing the learning curve for employees. The result was an ERP that was just as powerful and flexible as a proprietary tool—but since it relied on Odoo, it was much more flexible and much less expensive. Ultimately, it was Odoo’s open design that won Toyota Material Handling over. Cottet says that Toyota’s best IT asset is people, and Odoo allows them to use these assets in an optimal manner. There’s also the user experience; Cottet describes the application as “quiet ergonomic,” an apt description for Odoo’s intuitive interface. WWF started working with Odoo Silver Partner, who came up with a solution for them, using Odoo as a wireframe. Standard Odoo functionality with a custom agricultural overlay was a perfect fit for WWF and the needs of their projects. It also fulfilled all their other requirements – WWF wanted an open source solution, low implementation cost as well as the opportunity to easily build and integrate future modules. Using client-server architecture and an internet based solution allowed the program to actively track and manage over 4 million square meters of eucalyptus within the program while rapidly increasing reporting times and budget controls. Although Danone is a significant SAP client, the industry giant decided to use an open source integrated ERP solution for the emerging countries where it operates. OpenERP was integrated in three of Danone’s entities in Columbia, Argentina and Australia. Although the company has invested a lot for several years integrating SAP, it proved not to fit the needs that Danone had in the green field entities. From 2007, the structure of the group had changed, finding themselves in the position of having to manage smaller entities, which were not necessarily generating big revenue. So, implementing their core model SAP didn’t make sense. Consequently, a less expensive and more flexible solution was sought, allowing faster implementations. SAP covers a large array of needs, it’s an integrated non-modular software, not offering a lot of room for mistakes. OpenERP as a solution was proposed to Danone, as they considered it to be backed by a solid software editor and a strong community. Danone explained further that it was easy to work with OpenERP as it is well suited to agile implementation methodologies. Satisfied with the results of the implementation, Danone took up the project to synchronise OpenERP with SAP. COX Communication is the third largest cable television and gaming services provider in the United States. They are serving more than 6.2 million customers which ultimately make them seventh largest player in the country. They introduced the product “Flare” which is an online gaming application and entertainment system for a complete family. When COX Communication started with Flare Gaming System, they were looking for one platform which can cater to their requirements such as Sales, CRM, Billing, Warehouse, Inventory Management, Shipping and eCommerce solution. They had 3 different sales channels and call centre and had no system to record and maintain the sales activities. Cox wanted to develop an online gaming website with PCI Compliance which can help them to keep customers information protected. The CRM and Sales Module was customized which helped COX to channelize the sales activities and maintain customer records. An Online Magento Website was developed under PCI compliance. The warehouse module helped them to automatically process the orders in ERP and FedEx Integration with ERP empowered them for direct shipping of products. The newly developed ERP was integrated with various gaming providers. After ERP Implementation, COX Communication experienced rapid success in business growth. All the departments where aligned and organized with the ERP system including Sales, Accounting, Logistics and supply chain. It became easier for the top Executives to track and monitor the performance in a 360 degree view.